Our hotel is an ideal place to enjoy quietness and relax in natural surroundings. There are 9 rooms in our boutique hotel, so comfort, privacy and personal approach to every guest are guaranteed. For those guests who will be staying for at least 10 days at our hotel, transfer to Colombo airport is free of charge. Our location suits perfect if you wish to see around the island and don’t want to spend much time and/or money for the transfer between the must-see places. Treat yourself with a rejuvenating yoga and meditation holiday in Sri Lanka. 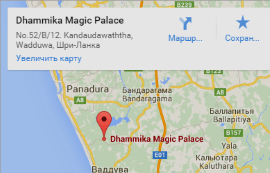 Dhammika Magic Palace welcomes you to enjoy a wide variety of yoga and meditation programs suitable for beginners, intermediate or advanced level practitioners.